Nominations for Olivier awards 2014, where did all go wrong? I need to start with an overriding principle: all awards for artistic achievement are inherently flawed. They always represent a compromise and therefore can’t express the joy of personal experience. They are also needed in hundred different practical ways, no point bemoaning their sheer existence or the agenda a specific award represents. The Oliviers focus on mainstream productions, complaining they ignore obscure edgier offerings is pointless. What struck me with the 2014 Oliviers nominations though was how the list was underwhelming, even by the standards of the commercial mainstream agenda. It’s been a good year for history plays. From Edward II at the National, to Richard II at the Royal Shakespeare Company to Henry V at the Noel Coward’s, they form a perfect chronological line (even if we leapfrogged over Henry IV), which means I can play silly games: John Heffernan is David Tennant’s great-grandfather and David Tennant is Jude Law’s uncle. It’s not every day you can say that. 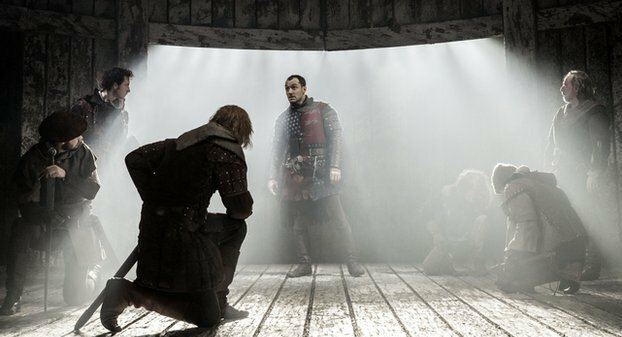 Silly games aside, how does Michael Grandage’s production of Henry V fare in comparison? Not too badly it turns out, even if it doesn’t scale the dizzy heights of love I feel for the other two productions. It’s an involving if unambiguous version of the play, and what it lacks in complexity, it makes up for in fluency and immediacy. I would have liked a more searching reading, but the production’s pull and drive is undeniable. Jude Law commands stage and language (not to mention subjects) easily. His Henry V is not complex or questioning, but his straightforward commitment is winning and his steering speeches are underpinned by a warm and intelligent presence. 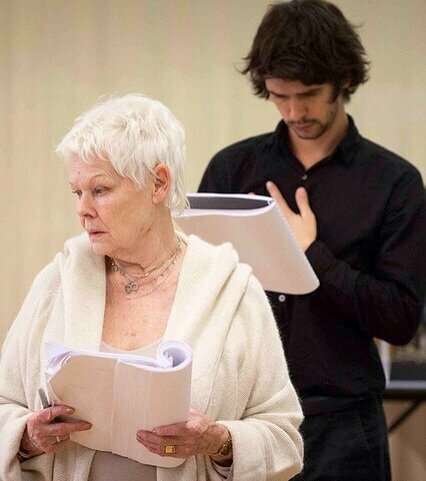 Judi Dench and Ben Whishaw in rehearsals. Photo Marc Brenner. Are any children born with an intrinsic love for money? I don’t know why this thought popped to my head as John Logan’s Peter and Alice finished. The play has no materialistic obsessions. But it deals with the passage to the adult world, and money is an entirely adult concept. It is 1932. Alice Liddell Hargreaves is 80. Peter Llewelyn Davies is 35. They meet for the first time. These two people have a unique bond, everyone is connected to their childhood. But they are not connected to theirs. Peter Davies is desperate to understand the missing links. Alice Hargreaves knows not to be desperate for anything. 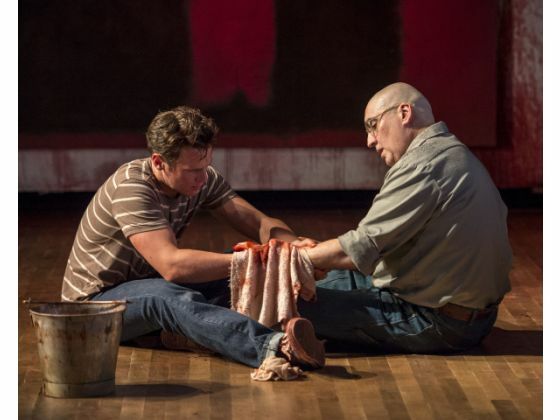 John Logan’s play is focused on the passage to adulthood: From a place of moral, intellectual and emotional clarity we move backwards to a place of pain and confusion. What do we actually learn or know to do better? Rumour is the National Theatre’s Christmas show at the Olivier will be Arthur Wing Pinero’s The Magistrate, starring Nancy Carroll and John Lithgow. Farce plus one of my favourite actresses, roll on Christmas. (It will replace the previously announced, and then cancelled, production of The Count of Monte Christo). Update 18/11/2012: Having seen one of the early previews of the production, you can read my review here. Director Jamie Lloyd launches his own production company in association with the Ambassador Theatre Group. 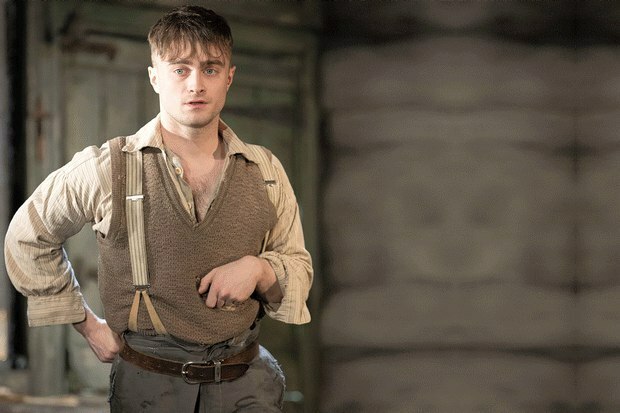 The announcement of this new commercial theatre venture comes not long after Michael Grandage announced his West End season of five plays chock full of big names (Simon Russell Beale, Ben Whishaw, Judi Dench, Daniel Radcliffe). Although my wallet undoubtedly suffers when I have to pay West End prices, it’s healthy to have commercial theatre that feels exciting. A couple of years ago, the Royal Shakespeare Company produced and toured Ben Power’s play A Tender Thing, a new way of looking at the story of Romeo and Juliet. I was sad to miss it then, but the play returns at the RSC this autumn, this time with two of my favourite actors, Richard McCabe and Kathryn Hunter. Not missing it this time. Anne Marie Duff at the Donmar was already exciting news, but now the remaining cast for Jean Racine’s Berenice has been announced: Stephen Campbell Moore and Dominic Rowan will join her as husband and lover. In this “perfect tragedy of unfulfilled passion“, it’s a delicious combination. When I first saw Jonathan Groff in Glee, I didn’t pay much attention to him. There is much young talent in Glee and he didn’t seem much different. But a couple of years later, he showed up in Deathtrap at the West End, and anyone who can go toe to toe with Simon Russell Beale, it’s worth keeping an eye on. In some ways, I was even more impressed when I saw him in the one off performance of the 24 Hour plays at the Old Vic a few weeks later. With uneven material and very little rehearsal (as it’s inevitably the case in occasions like that), he still made a great impression. Since then, he went back to New York to appear in the off Broadway production of The Submission (playing another, if quite different, playwright than the one in the Deathtrap), went back to Glee and also has another recurring role in the political drama series Boss.